If you're a coach, looking to boost your players' skill level, increase your ball movement, and skyrocket your point production... then this drill collection is just what your team needs! Skillfully move the ball to any spot on the floor, exploit mismatches, and create easy scoring chances for your team! In no time at all, your offense will be humming like a well-oiled machine, with precision cuts and crisp passes. Your ball movement will skyrocket. Your turnovers will disappear. And you'll finally be playing that "beautiful game" every player, coach and fan LOVES to see! This Drillbook Shows You Exactly How To Run Each Drill... And The BEST Way To Teach It! Listen. I'm not just handing you a stack of scribbled notes on a paper napkin and telling you to figure it out on your own. To shorten the learning curve and really make sure you and your players "get" this stuff immediately, every drill is explained with detailed diagrams and "brain dead" simple coaching tips and pointers. So you can take this information to the court TONIGHT, and start using the drills at your very next practice. The methods contained inside are simple, proven and FAST to learn. You'll be amazed at how quickly your kids improve. Sure, I've been studying basketball skill development for a long time - but I still consulted every coaching expert I knew, and personally tried and tested dozens of different drills with my own teams, then added my own personal experiences to develop this system. All 21 of these drills are based on concepts and ideas from some of the most established and successful high school and college coaches of all time. Whitney Young Magnet High School, Chicago IL. Bishop McGuinness Catholic High School, Greensboro NC. Don't let the size of this short drillbook fool you. Over 100 hours of research (and many thousands of dollars) went into this project. The drills contained inside are simple, proven and FAST to learn, so you can start using the drills at your very next practice (tonight if you want). Why Do All That Research Yourself? How much is your time worth? Think about it, why should you go out and duplicate all the time and effort I put into this research? I've been to the clinics, studied the championship coaches, and done the trial and error for you, so you don't have to. I've pulled together in one simple collection every drill you'll need to improve your players' shooting skills and start dominating your opponents on the offensive end. This system is guaranteed to work with kids of all ages - no if's, and's or but's about it. The confidence you'll feel, walking onto the court at your next practice, armed with an arsenal of creative basketball drills your players will love. The fun and satisfaction you'll experience, watching your kids get better and better each week, piling up the wins, and developing a love for the game that will last them a lifetime! If you're thinking, "$7 is so cheap - what's the catch?" - there isn't one. Listen, I know that coaching youth basketball is loads of fun, but it's a lot of work too. And I've devoted my life to helping folks like you save time and energy, while experiencing more success with their teams. In fact, I'm only charging $7 for three reasons. $7 puts the report within reach for the vast majority of people. It's not expensive for even the humblest beginner. So if you're serious about becoming a better coach... or serious about helping your own kids reach their full potential.. click the Add to Cart button below now. If you need to justify the expense, skip going to McDonalds for dinner once this week and it's paid for. Guarantee #1 - If for any reason, you think this isn't the best $7 you've ever spent, just send me an email within 60 days of purchase and I'll gladly refund you the whole purchase price. Guarantee #2 - If you actually use these drills and they don't work as well as I've promised I'll actually refund TWICE your money. All I ask is that you give me an honest effort. How is that for fair? It's just 26 pages. Short enough to read in one sitting. But don't be fooled. There's more real, actionable information jammed into this PDF, than you'll get watching a dozen basketball DVDs. The drills inside have worked for other people just like you, and it's 100% guaranteed to work so you can't possibly lose money. It's a no brainer. Best of all, you can access everything just a few moments from now... and start using these drills at tonight's practice. Plus, if you're one of the first 500 coaches to order, you'll also get this free bonus! After you download the playbook, you have my permission to reprint up to 20 copies of it for your own coaching staff and players... so you can get your entire team up to speed as quickly as possible! Help You Jumpstart Your Season! Time is very much "of the essence." If you want to help your players reach their basketball potential, you need to start RIGHT NOW. Click the Add to Cart button below to get instant access to Team Ballhandling Drills - Risk Free for just $7. YES, I want in! I want access to the Team Ballhandling Drills eBook and the Team License. Please give me INSTANT access to this step by step coaching system right now! This system is waiting for you to claim it. Just $7 gets you instant digital access so you can start using these drills tonight. As soon as your order is securely processed, we'll direct you to our secure members area, where you can download all the material right away in PDF format. You can print the report out to share with your coaching staff, or download it to your smartphone, tablet or eReader device and bring it right to practice! There's an old saying - pioneers get scalped, while settlers prosper. Why would you waste time trying to develop your own drills from scratch, searching the web for unproven ideas, or spending hundreds of dollars on DVDs or coaching clinics. I've already done the research... spent the time filtering out what doesn't work… and compiling it all into this incredible "best of" collection. Just download Team Ballhandling Drills and you'll get instant access to a complete system you can start using today! 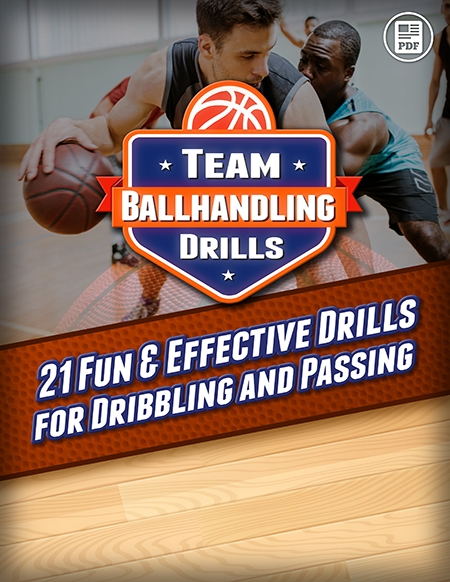 Click here to get instant access to Team Ballhandling Drills now for just $7! Remember, you get a full 60 days to review all the drills and see if they work for you. And if you're not 100% satisfied I'll send you DOUBLE your money back! 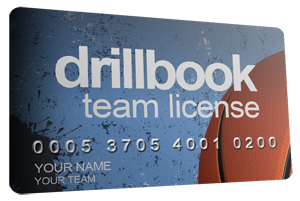 The drillbook is designed for teams of all ages, from youth to college. We’ve included basic, intermediate and advanced level drills, all explained with simple step by step instructions and diagrams. So you’re guaranteed to find something appropriate for your team. Nope, just the usual stuff every coach already owns – a whistle, some basketballs, and some cones. Some of the drills can be done in a half court setting, while others require a full court with two baskets. What if I'm not happy with the drills ? This package comes with a special “Double You’ll Love It” Guarantee. If for any reason, you think this system isn’t the best $7 you’ve ever spent, just send me an email within 60 days of purchase and I’ll gladly refund you the full payment. If you actually use these drills and they don’t work as well as I’ve promised I’ll actually refund TWICE your money. Why is it just $7? I want to make sure every basketball team has a chance to succeed – so we can get more kids involved and grow this incredible game. And I know that most of my customers are volunteer coaches – with a small budget to spend on their own education and training. So I decided to make this system as affordable as possible. $7 puts the ebook within reach for the vast majority of people. It’s not expensive for even the humblest beginner. Hurry... Get Team Ballhandling Drills Now! ... all for just $47 $27 $7. Click the Add to Cart button now for INSTANT ACCESS!